My dissertation is about the role of software in scholarly communication. Specifically, I’m interested in the way software code is itself a kind of scholarly communication, and how the informal communications around software production represent and constitute communities of scientists. I see science as a cognitive task accomplished by the sociotechnical system of science, including both scientists and their infrastructure. Looking particularly at scientist’s use of communications infrastructure such as email, issue trackers, and version control, I hope to study the mechanisms of the scientific process much like a neuroscientist studies the mechanisms of the mind by studying neural architecture and brainwave activity. To get a grip on this problem I’ve been building BigBang, a tool for collecting data from open source projects and readying it for scientific analysis. I have also been reading background literature to give my dissertation work theoretical heft and to procrastinate from coding. This is why I have been reading Imre Lakatos’ Proofs and Refutations (1976). Proofs and Refutations is a brilliantly written book about the history of mathematical proof. In particular, it is an analysis of informal mathematics through an investigation of the letters written by mathematicians working on proofs about the Euler characteristic of polyhedra in the 18th and 19th centuries. Whereas in the early 20th century, based on the work of Russel and Whitehead and others, formal logic was axiomatized, prior to this mathematical argumentation had less formal grounding. As a result, mathematicians would argue not just substantively about the theorem they were trying to prove or disprove, but also about what constitutes a proof, a conjecture, or a theorem in the first place. 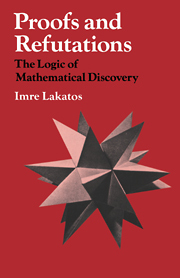 Lakatos demonstrates this by condensing 200+ years of scholarly communication into a fictional, impassioned classroom dialog where characters representing mathematicians throughout history banter about polyhedra and proof techniques. What’s fascinating is how convincingly Lakatos presents the progress of mathematical understanding as an example of dialectical logic. Though he doesn’t use the word “dialectical” as far as I’m aware, he tells the story of the informal logic of pre-Russellian mathematics through dialog. But this dialog is designed to capture the timeless logic behind what’s been said before. It takes the reader through the thought process of mathematical discovery in abbreviated form. I’ve had conversations with serious historians and ethnographers of science who would object strongly to the idea of a history of a scientific discipline reflecting a “timeless logic”. Historians are apt to think that nothing is timeless. I’m inclined to think that the objectivity of logic persists over time much the same way that it persists over space and between subjects, even illogical ones, hence its power. These are perhaps theological questions. What I’d like to argue (but am not sure how) is that the process of informal mathematics presented by Lakatos is strikingly similar to that used by software engineers. The process of selecting a conjecture, then of writing a proof (which for Lakatos is a logical argument whether or not it is sound or valid), then having it critiqued with counterexamples, which may either be global (counter to the original conjecture) or local (counter to a lemma), then modifying the proof, then perhaps starting from scratch based on a new insight… all this reads uncannily like the process of debugging source code. The argument for this correspondence is strengthened by later work in theory of computation and complexity theory. I learned this theory so long ago I forget who to attribute it to, but much of the foundational work in computer science was the establishment of a correspondence between classes of formal logic and classes of programming languages. So in a sense its uncontroversial within computer science to consider programs to be proofs. As I write I am unsure whether I’m simply restating what’s obvious to computer scientists in an antiquated philosophical language (a danger I feel every time I read a book, lately) or if I’m capturing something that could be an interesting synthesis. But my point is this: that if programming language design and the construction of progressively more powerful software libraries is akin to the expanding of formal mathematical knowledge from axiomatic grounds, then the act of programming itself is much more like the informal mathematics of pre-Russellian mathematics. Specifically, in that it is unaxiomatic and proofs are in play without necessarily being sound. When we use a software system, we are depending necessarily on a system of imperfected proofs that we fix iteratively through discovered counterexamples (bugs). Is it fair to say, then, that whereas the logic of software is formal, deductive logic, the logic of programming is dialectical logic? Bear with me; let’s presume it is. That’s a foundational idea of my dissertation work. Proving or disproving it may or may not be out of scope of the dissertation itself, but it’s where it’s ultimately headed. The question is whether it is possible to develop a formal understanding of dialectical logic through a scientific analysis of the software collaboration. (see a mathematical model of collective creativity). If this could be done, then we could then build better software or protocols to assist this dialectical process.